Madrid, Ville Considerable de la Nouvelle Castille. 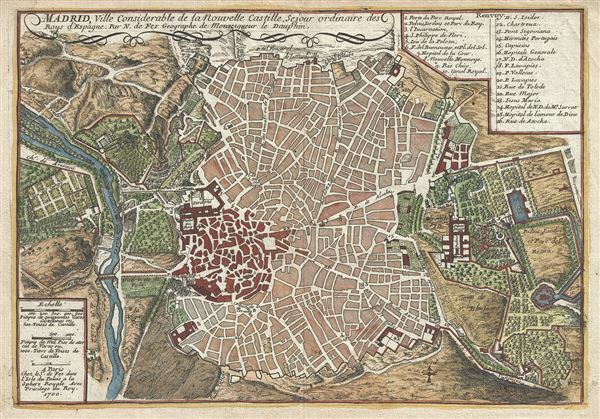 This is a beautiful 1700 map or plan of the city of Madrid, Spain by Nicholas De Fer. Centered on the Puerta del Sol, this map covers the center of modern Madrid, Spain's capital city, as well as the surrounding parks, farms, and estates - most of which have since been urbanized. The Buen Retiro Palace and Park are noted and beautifully rendered. The map shows the entire city in extraordinary detail offering rich topographical information with beautifully rendered farms and estates. A key in the top right quadrant lists twenty six places of interest marked on the map. At the time, all of Spain was witnessing the War of the Spanish Succession. After the death of the Spanish Habsburg King Charles II, the Spanish crown passed onto his successor Prince Philip of Anjou. Fearing that a union between France and Spain would threaten the balance of power in Europe, the Grand Alliance of the Holy Roman Empire, Portugal, Dutch Republic and the Duchy of Savoy declared war claiming the Spanish throne for Archduke Charles of Austria instead of Philip. The city of Madrid would be captured by King John V of Portugal in 1706, and recovered by King Philip V at the end of the same year. In 1711, when the Austrian Emperor Joseph I died leaving Archduke Charles as his successor, an even greater threat of an Austrian-Spanish Alliance loomed if Charles were to claim the throne to both Austria and Spain. The war would end in 1714 with the signing of the treaties of Utrecht, Rastatt and Baden. Philip would become King of Spain after all, on the condition that he is removed from the French line of succession. Spain lost many of its territories and granted Great Britain asiento. This map was created by Nicholas De Fer for his 1701 Atlas. Fer, Nicholas de, Cartes et Descriptions Generales et Particulieres pour l'intelligence des affaires du temps, au sujet de la Succession de la Couronne d'Espagne, en Europe, en Asie, Afrique, et Amerique, (Paris) 1701. Very good. Minor wear along original centerfold. Original platemark visible. Minor overall toning and some spotting.